Privacy and confidentiality are important factors when it comes to dealing with client information. When patients visit the hospital, communicate with doctors and their mental health specialist, hey expect all of the information to be retained securely. In the incredibly digital world we live in, our data can be exposed to being attacked, but with secure systems in place, the chances of this happening make it very difficult for any hacker or threat to break through and damage or steal confidential information. Being compliant with secure laws and regulations regarding your data, can increase your chances of keeping you and your client’s information safe from any attacks. Healthcare institutions and professionals in the US are subjected to HIPAA-compliance. And this is also the case when texting or communicating with clients. There are plenty of resources that inform you about the possible services for HIPAA-compliant texting, but in this article we’re going to dive into some of the benefits of being HIPAA ready when communicating with clients. Like most things, all forms of communications suffer from a chance of being interrupted or even being prone to attack. There is a host of risks that come with text-messaging, as we’ve seen in the past with various scandals in the press. Text messages can often be accessed without any need or level of authentication, leaving all of your text messages on the device accessible without the use of a password. The privacy of your clients and their protected health information (PHI) should be your key concern. Clients themselves might also be less likely to communicate depending on the security levels of the tools you’re using. Communicating with no protection can lead them to be exposed to any party and doesn’t restore confidence and even stress levels when they are doing so. That’s why formalising this is so important. With all these threats being said, you might be lacking in trust in the entire text-messaging system, but this doesn’t have to be the case. As a therapist, taking control of your client’s information and data is your responsibility. There are so many benefits once you’ve taken the leap to make sure that you are HIPAA-compliant with your text messaging and your clients will be thankful they have the ability to communicate with you in a secure manner that is convenient for them as well. Therachat for instance, offers unlimited HIPAA-compliant texting or messaging with clients and comes with a free mobile app for your clients. Secured personal information for the client will give them peace of mind, providing them with less stress and anxiety of being breached or even exposed during the length of their treatment and afterwards. 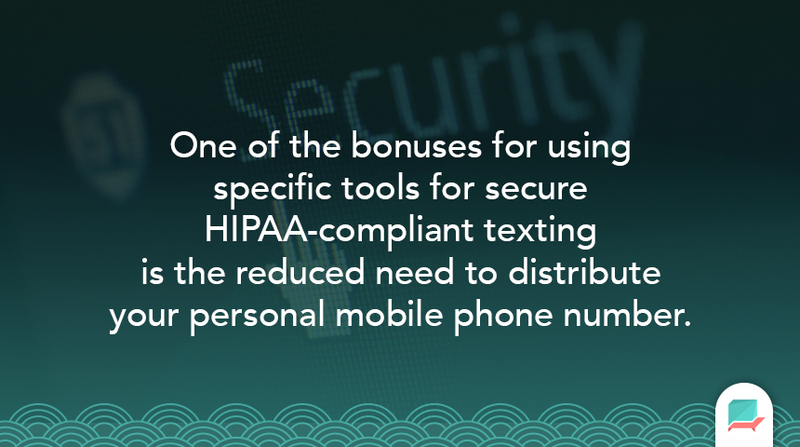 One of the huge bonuses as a therapist for using specific tools for secure HIPAA-compliant texting is the reduced need to distribute your personal mobile phone number. Being interrupted at home might be a thing of the past, as therapists can now communicate solely via the HIPAA-ready communication channels on- and offline. Having everything in one place just makes life a lot easier when you’ve got a busy day of clients. Same thing goes for when you want to follow-up in between sessions. Being able to access all messages in one place, will help you save time. Most of the HIPAA-compliant texting tools provide you with the method of EHR record upload, saving you space and time when it comes to accessing all of the records in one location. These are just some of the ways HIPAA-compliant texting can help you save time, worry less while still maintain a good service with your clients. Text-messaging compliance with HIPAA has been tested in other areas of healthcare. With physicians using HIPAA-compliant messaging, the secure text messaging method becomes even more beneficial as they communicate with patients. Allowing the staff to remotely manage and tend to the care and recovery of their patients, reducing the chances of relapse or negative results. One physician in Healthcare IT News stated that the text-messaging communication has helped as an important element of their first 3-day recovery strategy to provide patients with what they need. Being able to see results when it comes to homework compliance or even general communication with a client outside of therapy sessions will help tremendously. There are some negatives to using HIPAA-compliant messaging, but something you should notice is outweighed by the benefits. With this form of technology, you and your team or even as a solo therapist will incur regular fees of the service you are using for secure-HIPAA ready text messaging, but this is the price for security. Under the HIPAA-compliance regulations, the security configuration must be highlighted as part of the entire organization’s risk and management strategy, making you and your staff as an organization fully accountable for your communication with clients. If data is breached, the process and steps you need to go through to restore data or even to retain data are very complicated. This data processing and security don’t guarantee you’ll never have a breach. When you are not communicating with clients in between sessions, and it’s the first time you are thinking about implementing HIPAA-compliant texting, this might take up some of your administrative time. Setting boundaries with your therapy clients can minimize this. Also learning from thought leaders who implemented technology successfully in their private practice might be tremendously helpful. As you can see by some of these negatives, they are all factors to be aware of when you are using secure HIPAA- compliant communication tools with your client. Our recommendation is to explore the secure HIPAA ready communication platforms on the market, weighing up the features against each other and start securing your text messages today in order to restore some order to your communication. As you read this article, you may have had a few additional unanswered questions, that we might be able to help with. So here are some of the most prevalent questions in regards to HIPAA compliant messaging are. Is texting through SMS HIPAA-compliant? Texting via traditional SMS is not HIPAA-compliant. HIPAA privacy and security rules need to be implemented. All SMS messages need to be secure and complies with HIPAA privacy rule. In order to make your messages SMS HIPAA compliant, both the sender and the recipient should be users of a secure messaging service that complies with the regulations. This means that they need to have a HIPAA-compliant messaging service when communicating with you like Therachat. The platform you use must adhere to the policies of HIPAA, being accessible by adminstrative access in order to gain audit logs in certain cases. You need to consider this when implement texting between you and your client. Not all emailing platforms are HIPAA compliant. Let’s be clear with this. With all of the cloud-based solutions out there and even the ones that are “encrypted” or “secure” in their marketing messages aren’t HIPAA-compliant. Bringing your email to be HIPAA-compliant will take research and naturally understanding of the resource. There are many elements that email platforms need to have to apply and adhere to the HIPAA-compliant messaging from access control, to entity authentication and many other complicated functions. So when searching for an email application or platform is to make sure that you communicate with the platform’s support about whether the service is compliant with the HIPAA-process. What happens if I communicate in a non-HIPAA compliant way and there’s a breach in data? There are many ways that you can breach HIPAA compliance. From a lack of training to breach of data through social media. Making sure that all of your communication is HIPAA-compliant is important, as there’s a chance of a breach at anytime. A breach in data with a non-HIPAA compliant method can cause huge issues. Essentially the data or communication can have been compromised or breached by a digital attack. So if there is a non-HIPAA-compliant data breach, all parties that are involved are equally at fault for the incident. As managers or leaders of your company, although, equally responsible, it’s important that all employees and clients are HIPAA-compliant and making sure that they trust all communication outlets day to day. 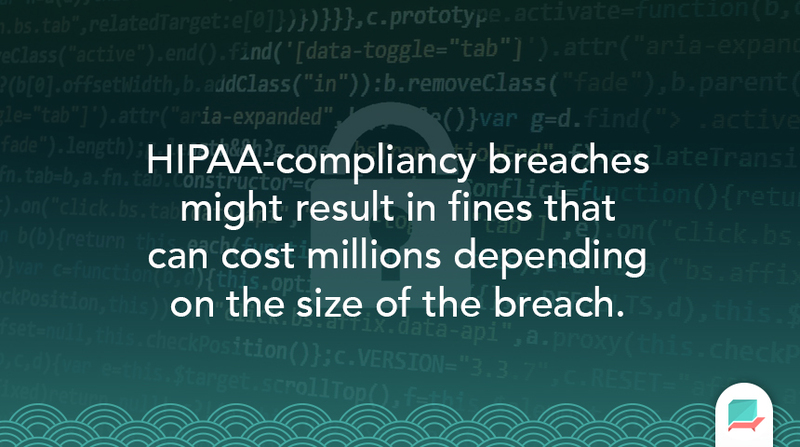 HIPAA-compliancy breaches might result in fines that can cost millions depending on the size of the breach. Sending secure messages is so important, as you can see from the consequences of breaching these safety regulations. 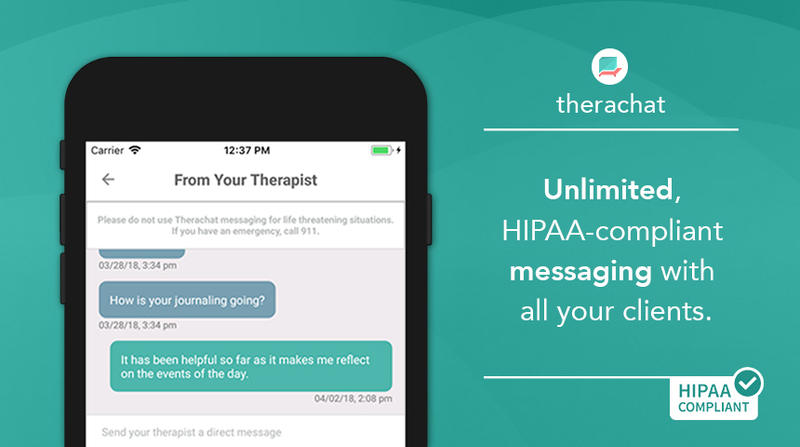 Searching for HIPAA-compliant texting tools can be hard, with Therachat you can send unlimited HIPAA-compliant messages with an unlimited number of clients. And you can do so from your computer, tablet or mobile phone. All completely secure and HIPAA-compliant. Perfect for communicating with clients effectively. Let us know in the comments below whether you have started using HIPAA-compliant texting or other communication methods and a few of the ways it has benefited you and your team.